Here is a tutorial on how to make a easy and fast gift card holder. 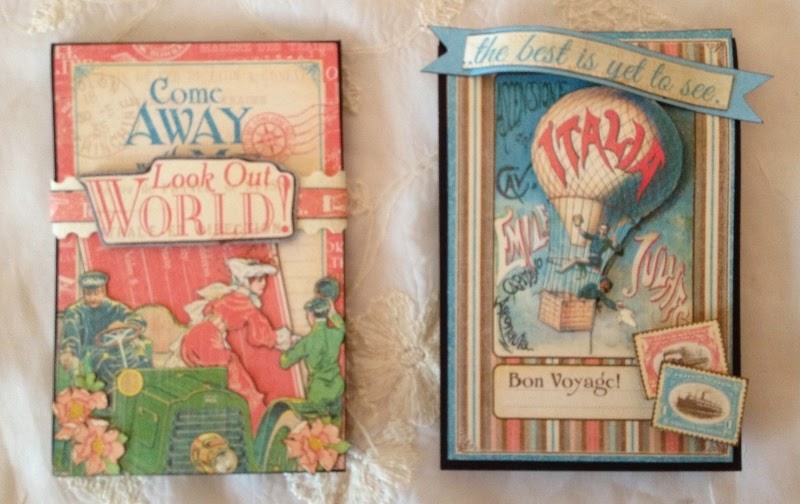 Use Come Away With Me 8 x 8 paper collection from Graphic 45. Will also show how to use magnets. Here are some pictures of the card in the tutorial. This masculine card closes with magnets. The cut aparts fits from the 8 x 8 paper pad fits perfect inside. Inside the flip there is place for a personal message. Also made an other more girly gift card holder. Can also make it more feminine with a seam binding bow and rose from WOC. Will also show in the video how to make a belly band to close the card up. If you have a ticket you want to make a gift card for you can just adjust the measurement. Woow esta precioso este tutorial, mil gracias!!! Super kort Anne, det skal da vist prøves af med det samme, da jeg har et barnebarn, som har fødselsdag på onsdag, og hun ønsker sig kun penge, så det må lige være noget for hende. Tusind tak for templatten. I like your idea, it is very nice. Thanks. Good afternoon Anne, I just love the idea of the gift card wallet and your video was great. I know I shall certainly be giving this project a go. Thanks for sharing and I hope you enjoy the rest of your day.